I have estimated the effects of these factors on each team’s average margin of victory using seasonal data for all 32 NFL teams between 2013 and 2016. This table presents the results for the remaining eight teams in the playoffs. The top half of the table shows the net difference between the home and away teams on each of our six factors. For instance, Houston gained an average of 13.4 more yards per game compared to its opponents; for New England, the comparable figure is just 0.2. That gives New England a net deficit in yardage of 0.2 – 13.4, or -13.2 as reported below. The other figures in the top half of the table are similarly calculated. Using my model, I can estimate the individual effects on the margin of victory (“point spread”) for each of these six factors. For instance, the effect for yardage is approximately 0.08 points per net yard gained, so the Texans’ 13.2 yard advantage on the ground compared to the Patriots is worth about 0.08 X 13.2, or 1.06 points, rounded to 1.0 in the table. The team with the greatest advantage in terms of yardage is Dallas, which gained on net almost 28 yards more per game against its opponents than did Green Bay. That difference is worth about 2.2 more points for the Cowboys in tomorrow’s game against the Packers. 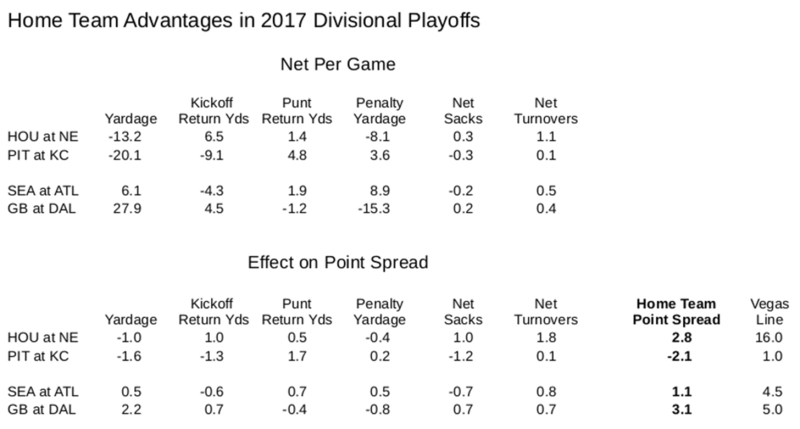 When we add up the various effects of each of these six factors, Dallas has the greatest predicted advantage at slightly over three points compared to the Packers. Next comes New England, whose advantage stems largely from creating more sacks and turnovers than do the Texans. The Atlanta Falcons hold a slight advantage over the Seattle Seahawks, while the Kansas City Chiefs are predicted to lose to the Pittsburgh Steelers in their game Sunday night. The last column on the right of the table shows the betting lines in Las Vegas for each game. 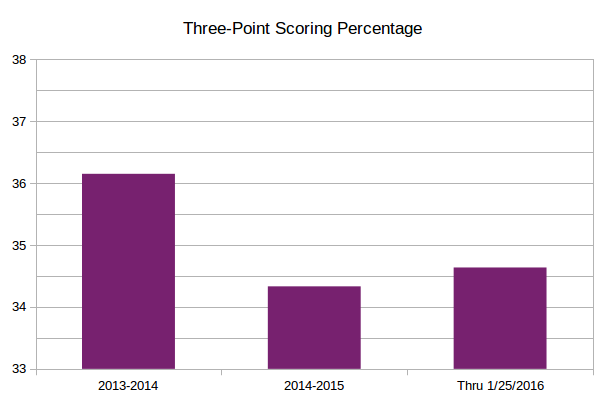 These are comparable to my predicted point spreads. The 16 point spread for the Patriots over the Texans is outrageously high both by historical standards and by my estimates. Atlanta is also more favored by bettors than the teams’ 2016 performances would justify. And, despite my model’s prediction that Kansas City should lose to the Steelers in Arrowhead, bettors prefer the home team by a slight margin. With the conclusion of week nine of the NFL season we have reached the midpoint of the 2015 regular season. All teams have played in at least eight of their sixteen games with four teams having played nine since they have not had the bye week. I decided to replicate last season’s analysis of the 2014 season to develop a “report card” for this year’s lineup of NFL team performances. The 2014 model included three predictors of a team’s margin of victory: net yards gained per game, net turnovers per game, and net sacks per game. The first two of these also help explain variations in a team’s margin of victory in 2015, but I find no separate effect so far for sacks. Perhaps that is just because they are relatively rare events which makes their effect harder to measure across just eight or nine games. 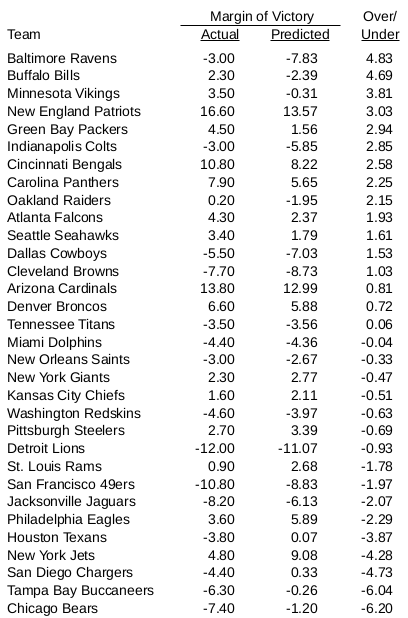 I also included a new factor this year, net yards gained or lost due to penalties. It turns out that penalty yardage has an effect on scoring that persists even after a team’s total yards gained or lost is factored into the equation. The effect is about the same for yardage due to penalties as net yards from scrimmage, about seven or eight points for every hundred yard a teams outgains its opponent. Including those factors lets us rank the 32 teams by how well their actual performance on the field compares to the performance my little model predicts. At the top of the list is the Baltimore Ravens. 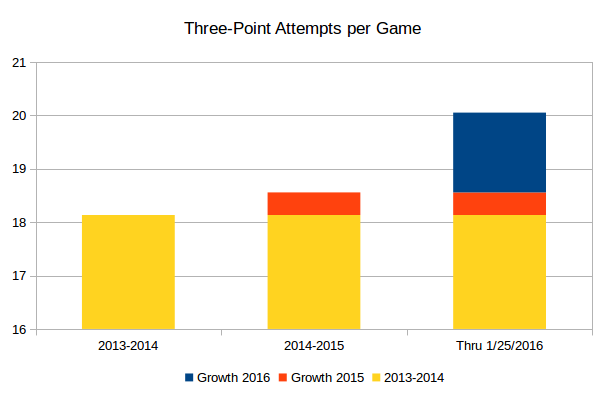 They have scored an average of three points fewer than their opponents, but that is almost five points more than their statistics would predict. The next five overachievers all outscore their opponents by a margin or three or four points more than we would expect given yardage, turnovers, sacks, and penalties. Two teams stand out as dramatic underachievers, the Tampa Bay Buccaneers and the Chicago Bears. Both teams score an average of six points fewer than their statistics would predict They are followed by the Chargers, Jets and Texans. Of those three only the Jets are predicted to outscore their opponents by a substantial margin, nine points per game, but they have managed to win by an average margin of just under five. 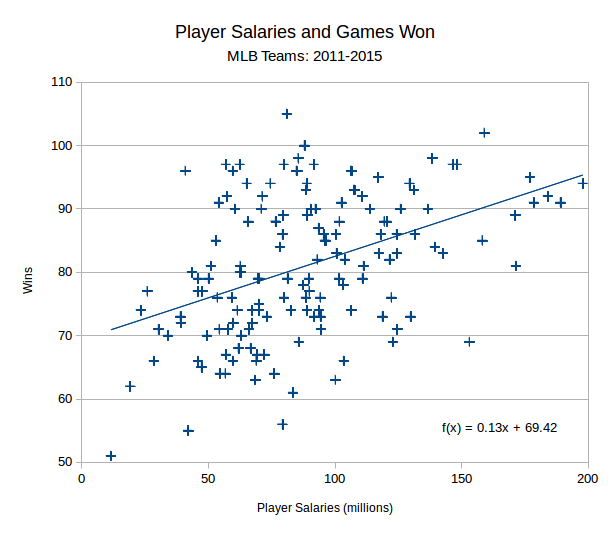 Does Spending Bring Victories in Major League Baseball? Over that same five-year period the Dodgers spent even more, $824 million, and the team’s investment has bought them a winning record but little else. The team advanced to the Championship round in 2013 with a victory over the Atlanta Braves, but lost to the St. Louis Cardinals. Last year the Cards foiled the Dodgers chances by beating them in the first round, and this year they fell to the Mets in the five-game divisional series. The New York Yankees have seen no better rewards than the Dodgers when it comes to their high-priced payroll. The Yanks also spent about $800 million on player salaries between 2011 and 2015 and averaged one more win than the Dodgers. Like the Dodgers, though, the Yankees’ playoff performance over these years has also been pretty dismal. They lost to the Detroit Tigers in the divisional round in 2011, and though they got past the Baltimore Orioles in that round a year later, they fell to the Tigers once more when playing for the pennant. This year they lost to the Houston Astros in the one-game wild-card playoff. When fans see teams spend enormous amounts in player salaries and get such mediocre results, they rightly wonder whether highly-touted expensive players are really worth the investment. These doubts only grow stronger when they see teams with considerably smaller payrolls like Kansas City, Oakland, Pittsburgh or St. Louis routinely make the playoffs and sometimes win the Series. 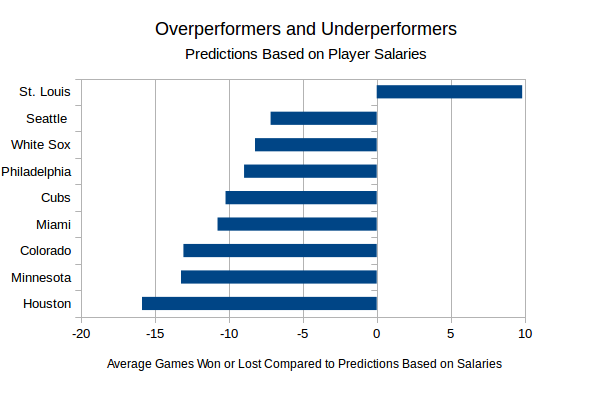 Teams that spend more on player salaries do win more games, but the price is pretty steep. The “slope” of the line, 0.13, tells us that it takes about $8 million to improve an average team’s performance by one regular-season win, since 0.13 X 8 = 1.04. One striking result is that only the Cardinals do significantly better than we would predict based on player salaries alone, averaging another ten games per season. No other team in baseball shows the savvy of the St. Louis front office in terms of staffing its clubhouse economically. On the contrary, what stands out are the many more teams that significantly underperformed given their payrolls. At the bottom of the list are the formerly hapless Houston Astros. In 2011, 2012, and 2013, the team spent about $80 million, $40 million, and just $11 million on player salaries. According to the model those figures should have generated between 70 and 79 wins. The Astros managed just 56, 55, and 51 victories in those years. Last year Houston improved to 70 wins, and this year Houston beat the Yankees in the wild-card game before falling to the Kansas City Royals in the divisional series. The other teams in the chart probably won’t come as a great surprise to anyone who follows baseball. The most poorly-served fans are our friends from Chicago where both the Cubs and the White Sox should be winning another eighteen games or so between them given their salary budgets. Notice that none of the big-spending teams I talked about at the beginning, the Dodgers, Yankees, or Red Sox make the list, though the Sox’ performance was only slightly better than Seattle’s. Finally let’s look at some simple predictions from the model. In this chart I have reproduced the relationship between spending and winning and added two vertical bars, at about $62 million and $150 million. The first figure represents the amount an average team would have to spend to expect they can win half their games, or 81 from a 162-game season. 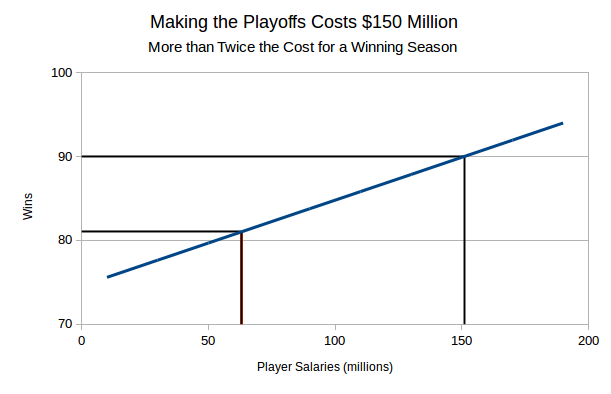 The second figure, $150 million, is the cost it takes to win 90 games. Nearly every team that has made the playoffs since 2010 has won 90 games or more, so $150 million represents the “entry fee” for having a solid chance at the playoffs. Unless you are the St. Louis Cardinals, of course. For more details see the Technical Appendix. 1I use “player salaries” rather than total payroll throughout. Player salaries include monies paid to positional players and pitchers. Total payroll can include other sums like “dead” money paid to departed players to whom the club still has a contractual obligation. 2For 2015, I have extrapolated teams won-loss record to the full 162-game season using their records through September 5th. In just a few weeks time the Selection Committee for the 2015 Division I Men’s Basketball Tournament, better known as “March Madness,” will be inviting sixty-eight teams to fill a field of sixty-four. (Eight of the teams play off for four of the sixty-four seedings.) These seedings matter greatly over the three weeks of the Tournament. Top seeds win on average four out of five games they play. Teams seeded seventh win half their games, while teams seeded twelfth win about two out of every five. Most college basketball fans know that the NCAA considers something called the “RPI,” or “Ratings Performance Index,” as a measure of each team’s strength. The Selection Committee uses RPI to help decide on at-large bids and seedings. 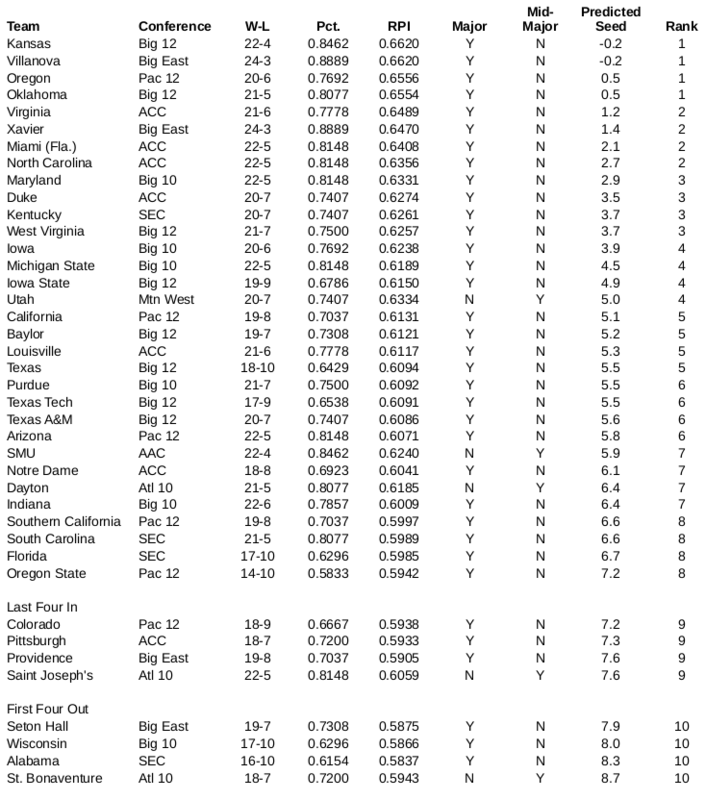 The RPI adjusts each team’s won-loss record by its “strength of schedule,” the won-loss record of its opponents. The NCAA also adjusts for the won-loss record of those opponents’ opponents. The team’s own performance gets only a 25% weight in the RPI. Its opponents’ record counts 50%, and their opponents records count 25%. These weightings make strength of schedule the primary determinant of RPI. In principle these adjustments should make RPI a neutral measure of team strength and remove the effects of conference affiliations. Teams playing in “major” conferences like the ACC or Big 12 have higher RPI scores because they play a tougher schedule. In a world where seedings depended only a team’s innate abilities, it shouldn’t matter which conference that team plays in. The historical data summarized in this chart says otherwise. The Selection Committee awards better seedings to teams playing in the major conferences than it awards to schools with identical RPI scores from weaker conferences. 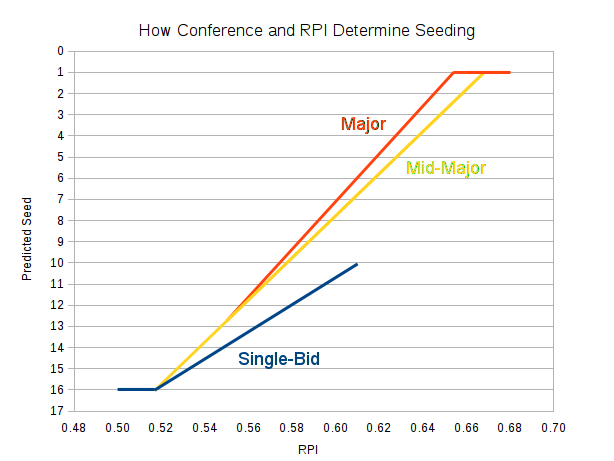 In the chart I’ve shown the relationship between seeding and RPI for teams grouped by their type of conference. At the top are the six “major” conferences — the ACC, Big East, Big 10, Big 12, Pac 12, and SEC. Next come the eight so-called “mid-major” conferences — Atlantic 10, Colonial Athletic, Conference USA, Horizon League, Missouri Valley, Mountain West, Western Athletic, and West Coast conferences. The Selection Committee routinely grants multiple Tournament bids to members of both these types of conferences. The eighteen remaining conferences receive only a single Tournament invitation, the one extended to each conference’s champion. This policy forever limits teams in these conferences to also-ran status. Take a team with an RPI of 0.600. If that school plays for a team in a single-bid conference, the Committee is likely to seed that team eleventh (10.7 according to the model). Put that same team in a mid-major conference, and it would be awarded an eight seed (7.8). Playing in a major conference would earn that team a seven (7.1). Both the advantage the majors have over the mid-majors, and the advantage they both have over single-bid schools, widens with RPI.